The world's numismatics are eagerly anticipating the release of the 2017 1 oz Koala Silver bullion coin on 9th January 2017. A product of Australia's prestigious Perth Mint, this beautiful coin is an affordable way to boost your portfolio and an excellent addition to any collection. The Silver Koala series was launched in 2007 and the 10th anniversary edition of the 1 oz coin is certain to be in high demand. Each coin contains one troy ounce of .999 silver. Collectors value these striking coins for their annually changing design and a limited mintage of 300,000 adds to their appeal. The 1 oz Silver Koala 2017 coin features the lovable koala bear, one of the most recognisable symbols of Australia. CoinInvest.com is one of Europe's leading bullion coin and precious metals traders. 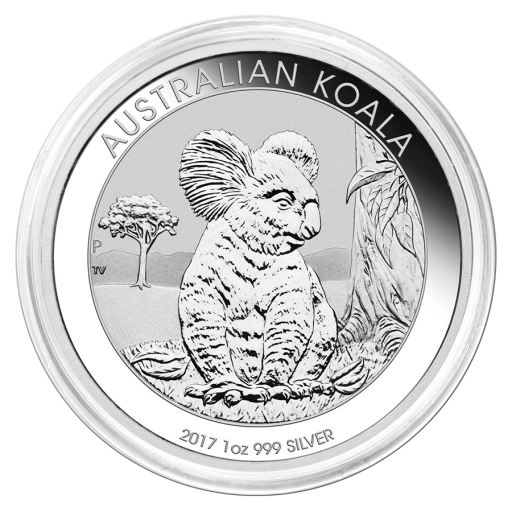 As a trusted supplier for some of the world's most famous mints we are able to offer coins like the 1 oz 2017 Silver Koala at the most competitive prices. Add silver 2017 1 oz Koala coins to your existing portfolio or choose these delightful coins for younger collectors. We ship all coins as promptly as possible to your preferred address. Order of 20 are packed in foil while 100 coins are boxed.